In a passionate & exciting Olympic pole vault competition, underdog Thiago da Silva cleared a personal best and new Olympic record 6.03m for the Olympic Championship. 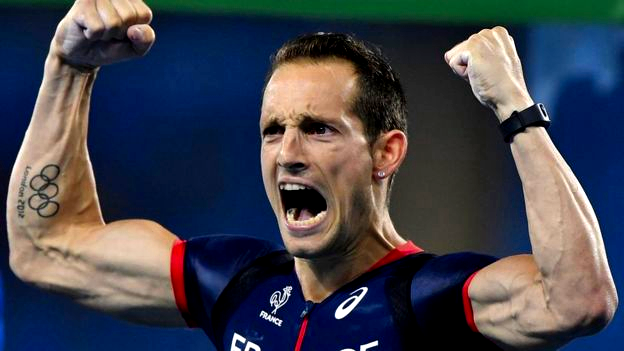 Defending champion Renaud Lavillenie took silver. It's reported that late-night fans at Rio's Olympic stadium became so partisan as to boo when Frenchman Lavillenie sought to defeat Brazilian da Silva. Fans have now been cautioned on sportsmanship. World recordholder Lavillenie compared his treatment by the crowd to that of African-American Jesse Owens at the 1936 Berlin Olympics, when racial superiority and eugenics were underlying arguments leading to the deportations and mass exterminations of the following dark Nazi years. Fans should at least clap politely for all competitors. The hard work of every athlete should be respected. Let's remember the Olympic ideals of Excellence • Friendship • Respect (link). We might be swept-up at times with partisan support; and as spectators fail to understand the challenges being overcome. Many of us have great respect & awe for the Olympic Champion, but we should also spare a thought for those who sought mightily -- and were perhaps defeated by economic handicap, sudden illness or injury, or the unfairness of political interference; areas beyond the competitive venue of physical superiority or shortcoming. And it might also be noted that as number one & world recordholder, the great champion Lavillenie wasted no energies when he was winning in comforting his many vanquished competitors. 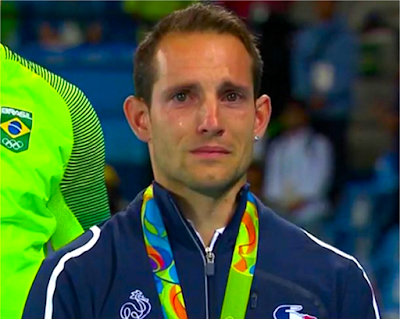 Now the Flying Frenchman is lost in tears, with his sob story stifling the Olympic achievements of new champion da Silva. Crybaby? Graceless loser? The fuel of champions needn't be the blood of competitors. Let's thank Lavillenie for a lesson on Olympic ideals. New championships are ahead -- for the mob to apportion both sympathy & glory.